UPDATED: Mon., Oct. 29, 2018, 7:46 a.m.
BERLIN – German Chancellor Angela Merkel said on Monday she is ready to hand over the leadership of her Christian Democratic Union (CDU) later this year, according to multiple media reports, offering the clearest indication to date that her time leading Europe’s largest economy is running out. Merkel has been CDU chairwoman since 2000 and while her departure from the party post would not automatically result in her stepping down as German chancellor, the move is an acknowledgment of her increasingly vulnerable position. 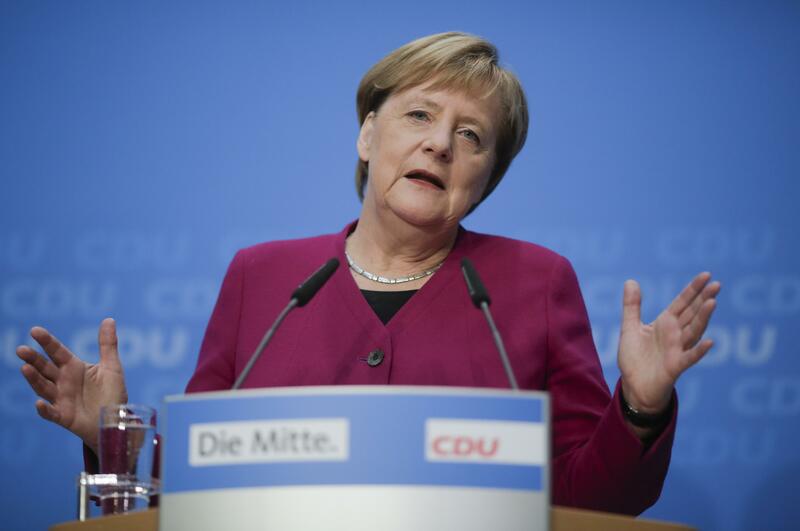 Merkel herself has said in the past that the chancellor should also be the leader of the ruling party. But according to German public radio, Merkel wants to stay on even after handing over the party leadership. The chancellor was expected to confirm her decision publicly on Monday afternoon. Reports of the announcement set off a flurry of speculation in the German media over who would succeed Merkel. The 64-year-old has led Germany for the past 13 years and, until recently, had not been seen as grooming a successor. Earlier this year, however, she appeared to have given her blessing to Annegret Kramp-Karrenbauer, the one-time leader of the west German state of Saarland and now the CDU’s general secretary. Kramp-Karrenbauer is seen as a moderate in the Merkel tradition. But the conservative wing of the CDU is also expected to mount a challenge. Merkel’s decision comes one day after her party suffered massive losses during regional elections in the state of Hesse, which has long been a bellwether for the nation. Just two weeks ago, the CDU’s sister party, the Christian Social Union, sustained similar losses in its home state of Bavaria. The move also comes a month after Merkel’s longtime floor leader in the German parliament, Volker Kauder, was unexpectedly defeated in his bid for reelection. The loss for the longtime Merkel confidant marked a rare moment when the CDU’s elected officials have defied the chancellor’s will. The election for the state parliament in Hesse – home of Frankfurt, the heart of German finance – gave Merkel’s center-right CDU 27 percent of the vote, according to projections based on partial returns Sunday night. Backing for Merkel’s coalition partner, the center-left Social Democrats (SPD), also plummeted, falling from 31 percent to 20 percent – a low not seen in 72 years. The Social Democrats’ weak performance in regional elections this year in Hesse and Bavaria has added pressure on their national leadership to force Merkel into more concessions. The Washington Post’s Luisa Beck contributed to this report. Published: Oct. 29, 2018, 6:50 a.m. Updated: Oct. 29, 2018, 7:46 a.m.